Cryogenic Insulation - Technifab Products, Inc. Vessels that require a high level of thermal isolation are typically enclosed in an outer vessel with a separating space that is vacuum evacuated. With an ambient vacuum 24-hour settle pressure in the 10-4 torr range, convective heat transferacross this space is virtually eliminated. Creating a very small heat path from the outer to the inner vessel typically controls conductive heat transfer. Selecting a material for this heat path that has very low thermal conductivity properties normally works well. Such materials include G-10 NEMA Grade Fiberglass and/or low-density ceramics. Radiated heat transfer is typically controlled by the barrier placed around the inner vessel. Its mission is to prevent heat from radiating into the inner vessel. One common radiation barrier used in cryogenic applications is known as Multilayer Insulation (MLI), or Super insulation. The space program encouraged the development of MLI around 1960. The MLI generally contains multiple layers of reflective material separated by spacers having low conductivity. MLI consists of many radiation shields stacked in parallel as close as possible without touching one another. MLI will typically contain about 60 layers per inch. MLI is anisotropic by nature, making it difficult to apply to complex geometries. MLI is generally very sensitive to mechanical compression and edge effects, requiring careful attention to details during all phases of its installation. Accordingly, performance in practice is not typically as good as theoretically possible. Each layer is isolated from the other by spacer material such as polyester, nylon, or Mylar. The aluminum foil is carefully wrapped around the container such that it covers the entire surface of the inner vessel. Spacer material, as described, is placed between the layers to completely prevent the separate coverings of foil from contacting. Should they touch, a thermal short circuit will occur and increase the heat transfer. The layers can be applied manually as blankets. These are hand cut to fit and wrapped over the vessel and vessel ends. Tape that has low out-gassing properties is then used to hold the blanket layers in place. Another method of applying the layers is by “orbital wrapping”. This method is used where high-volume vessels are being manufactured. Special equipment is required that wraps the alternating layers much like the wrapping of a spool of string. As the number of layers increase the insulation capability is also increased. Typically layers adding up to about one inch in total thickness is applied in the liquid nitrogen temperature range described. MLI is designed to work under high order vacuum, i.e., pressure below about 1 X 10-4 torr. To obtain this vacuum generally requires lengthy pumping along with heating and purging cycles. Chemical gettering materials are required to absorb the out-gassed molecules to maintain the vacuum over extended periods. Super insulation advancements are being made at the Kennedy Space Center. A new-layered cryogenic insulation system is being developed. This insulation is different from others due to its superior thermal performance in “soft” vacuum conditions. This system overcomes some of the typical shortcomings of super insulation discussed above. Those shortcomings include exhibition of different insulation properties when measured in different directions and sensitivity to mechanical compression. Foam Insulation requires no vacuum. Foams generally provide a barrier to heat conduction due to their low density. Furthermore, foams inhibit convective heat transfer by limiting convection to the individual cells, fissures, or other spaces within the foam structure. Foam insulation generally includes some form of moisture barrier. When moisture is allowed to accumulate within the spaces of the foam structure the thermal conductivity rapidly increases. Typical foam insulation includes polyurethane foam, polyamide foam, and foam glass. Foam insulation is generally not favored in cryogenic applications. Such insulation is likely to crack due to thermal cycling and environmental exposure. Cracks permit incursions of moisture and humid air that will form ice and greatly increase the surface area for heat transfer. Other types of cryogenic insulation systems include those where the evacuated annular spaces (space between an inner and outer vessel) contains bulk filled materials i.e. glass fiber, silica aerogel, or composites. As with MLI, these systems require vacuum levels of around 1 X 10-4 torr to be effective. Cryogenic insulation system performance is often reported for large temperature differences in terms of an apparent thermal conductivity, or “k” value. Boundary temperatures of 77 K (liquid nitrogen) and 295 K (room temperature) are common. The following “k” values discussed apply generally to these boundary conditions. MLI systems can produce “k” values of below 0.1 mW/m-K (R-value of approximately 1440) when properly operating at cold vacuum pressure below about 1 X 10-4 torr. For bulk filled insulation systems operating at a cold vacuum pressure below about 1 X 10-3 torr, K values of about 2 mW/m-K (R value of approximately 72) is typical. Foam and other similar materials at ambient pressures typically produce k values of about 30 (R value of approximately 4.8). All of the values given are for 1.0-inch thickness of insulation. The R-value is an industry standard unit of thermal resistance for comparing insulation values of different materials. The R-value is a measure of resistance to heat flow in units of degree F-hour-square foot/BTU-in. k = d/R where d is the heat flow distance. At a vacuum pressure of 0.02 torr many of the basic insulation designs give about the same thermal performance. Tests run by NASA KSC to develop a cheap replacement for Perlite that does not pack down and break the inner vessel supports has shown that a new silica aerogel seems to work quite well. Test results compare various insulating materials as a function of vacuum pressure. This is shown in the plot of effective conductivity below. All tests were performed with 1″ of insulating material (60 layers of MLI) in a test dewar. The MLI insulation obeys the radiation equation for a gray body where the heat leak depends on the emittance divided by the number of surfaces times temperature to the fourth power. A comparison of several designs shows a wide range of performance values as seen in the following plot. The actual use of MLI can be evaluated by looking at the conductivity per unit thickness as a function of vacuum pressure. 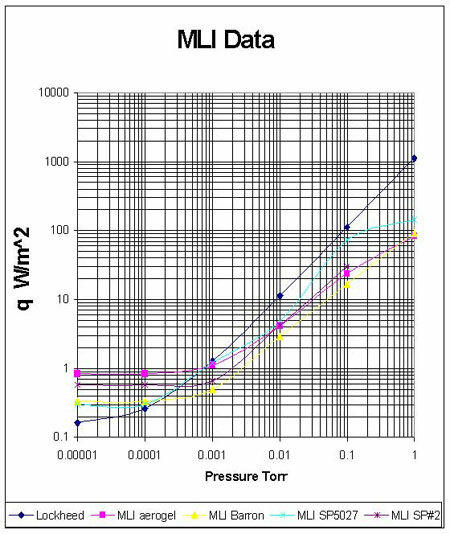 MLI will not work at pressures above 1E-3 torr, whereas Perlite and Aerogel will work quite well up to a pressures of 2E-2 torr. The summary of this information is shown in the following chart. 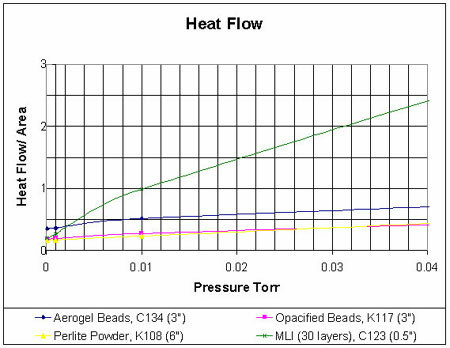 The chart shows that MLI is only useable if the vacuum pressure is below 1 milliTorr (1 micron) whereas Perlite and Aerogel work at pressures up to 10 milliTorr.